Buying a classic car is difficult. A rare engine or unique design difference could command tens if not hundreds of thousands more than a standard make and model, which limits who can buy such a vehicle. There are ways around that expensive caveat, and one example is this 1978 Chevy Corvette Daytona. 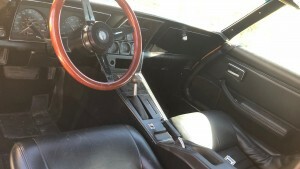 Corvette Blogger stumbled upon this Fort Myers, Florida Craigslist ad, which shows the condition of Corvette Daytona in what looks like decent shape. The seller says his father bought the car five or six years ago as a project vehicle; however, he was unable to finish the restoration before he passed away. The car is said to be about 90 to 95 percent complete. “Daytona” is in quotation marks above because this isn’t an original Corvette Daytona race car. It’s a base 25th anniversary Corvette with a custom IMSA Daytona wide body kit, which allegedly cost more than $20,000. The bright yellow exterior only accentuates the Corvette’s unique body lines. It’ll undoubtedly command attention at the next local car show. Sadly, details about the condition of the car are scarce in the ad. However, the photos show a car that needs some love before being 100 percent again. The exterior paint has blemishes with cracks around the door handle visible. The interior looks tired but is in otherwise decent shape. It doesn’t even have a radio. The ad lists the Corvette Daytona in “excellent” condition with a clean title and an automatic transmission. The late 1970s may not have been the Corvette’s greatest era, but the design is uniquely American and unabashedly aggressive. The car’s actual mileage is not known as it’s been sitting for the last two or three years, according to the ad. Imagine the Corvette Daytona after a full restoration. It’d look sharp inside and out, but the exterior would draw the most attention. That’d be a great thing to see on the road. Hmm . . . Fort Myers . . . that’s not too far a drive for me. But it’s gotta be worth my while. I think I’ll try to get him up to $18,000 . . . you did say that the owner would pay $14,500 to take it, right? Anyone who ‘customizes’ a ‘vette should be sentenced to life chained inside a Yugo GV.